I love Batman and I love toys, so it’s only natural that I’d love Batman toys. I’ve been a collector for as long as I can remember, and my first Batman figure was from the ’80s Super Powers series. 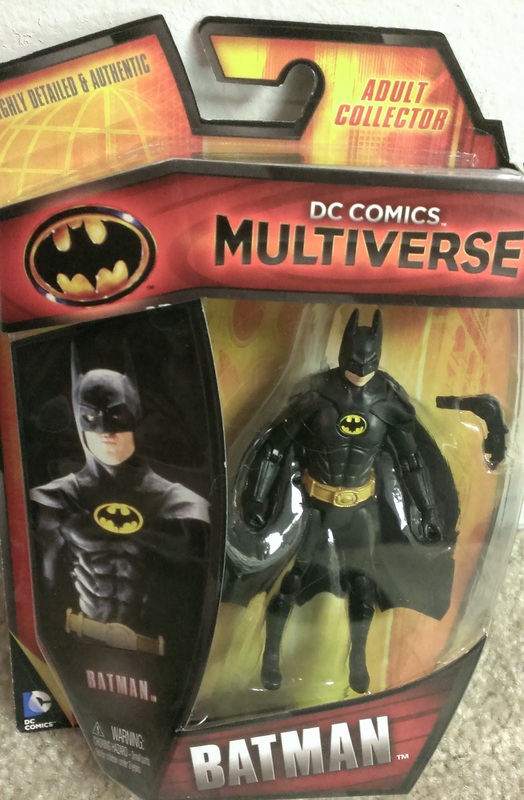 I still collect the figures when one catches my eye, and that was the case with Mattel’s new DC Multiverse figures. I’ve long been a fan of Mattel’s DC offerings, but that was when they were being sculpted in the 6 inch scale. I’m not really a fan of 4 inch figures, as I just don’t feel you get enough bang for your buck, especially since these figures are $10 and up. However, when I saw these figures shown off at last year’s San Diego Comic Con, I knew I had to have them. Today, we’re looking at Batman and Penguin. 1989’s Batman changed the game, for both the character and for comic book movies as a whole. It also ushered in a new era of Batman toys, thanks to Toy Biz. The offerings were slim for that first movie, as we only got three figures (including a few face variants on Batman) and some vehicles and playsets. With the exception of Bob the Goon, these figures couldn’t exactly be considered film accurate. Shortly afterward, Kenner got the Batman license and released The Dark Knight Collection, which would give fans their Michael Keaton Bruce Wayne and Jack Nicholson Joker figures. Outside of high end toy lines, these characters haven’t been reoffered in “standard” action figure scales. When Mattel started the Movie Masters line, many fans hoped that they would eventually reach back before the Nolan movies and give us figures from the Burton movies. Sadly, following Man of Steel, it appeared that Mattel was abandoning the Movie Masters scale. To our surprise, however, they introduced the DC Multiverse line, which featured Movie Masters sculpting at a 4-inch scale. Along with figures based on the Arkham Asylum series of video games, Mattel was also offering figures from the early Superman and Batman movies. Batman features articulation we’ve come to expect from Mattel, although missing are the bicep swivel and jointed ankles of DC Universe Classics. There’s a waist swivel, but no ab crunch. These are rumored to have been sculpted at 6-inches and scaled down, which makes sense because they have Movie Masters quality articulation. The soft goods cape is a welcome surprise after years of hard plastic capes. Batman comes with grapple gun, which seems slightly large for the scale. 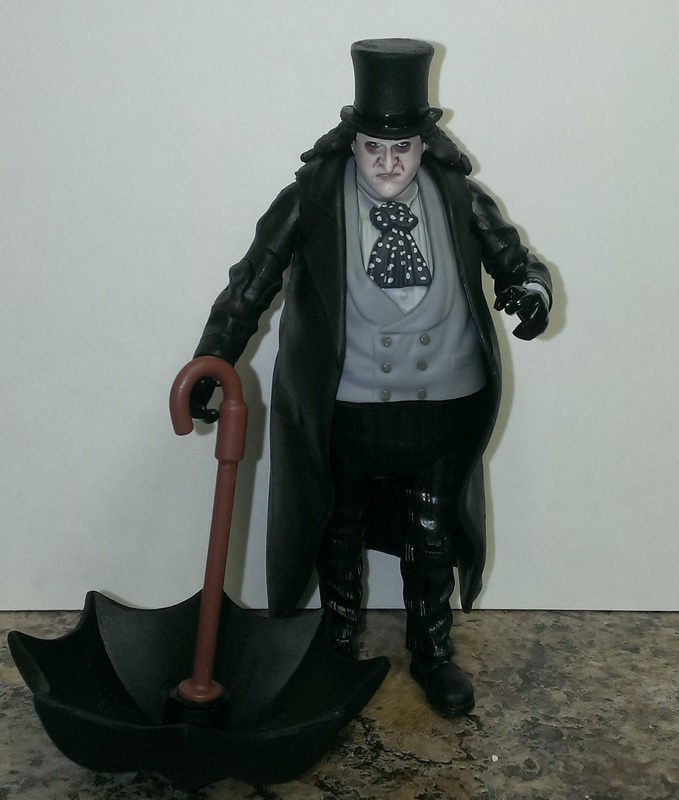 When Batman Returns came out, it’s rumored that the Danny Devito Penguin wasn’t released as a toy because Kenner thought it would scare children. So, instead, the Super Powers Penguin was repainted in black and red and released in the series. 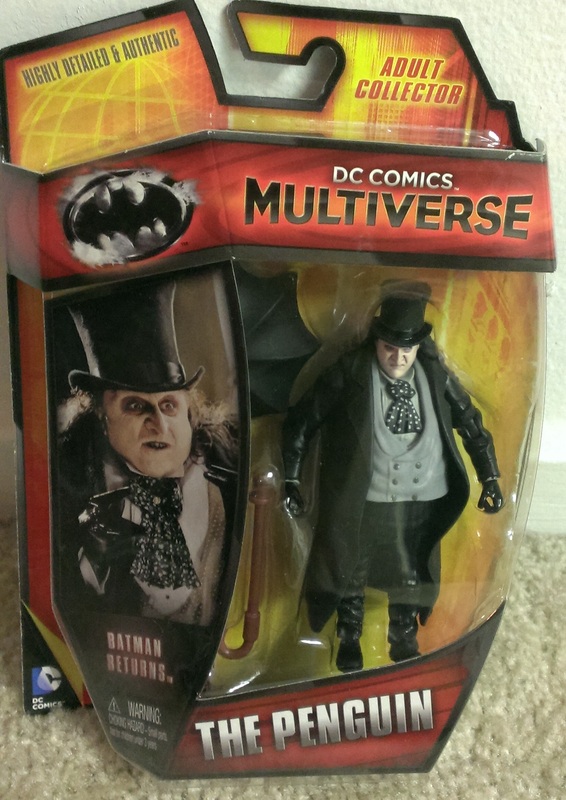 Fans would have to wait over two decades to finally get a film accurate Penguin, and here it is. Based on the likeness, the sculpting, and the paint apps, this figure is almost perfect. I say almost because it’s just slightly too tall. 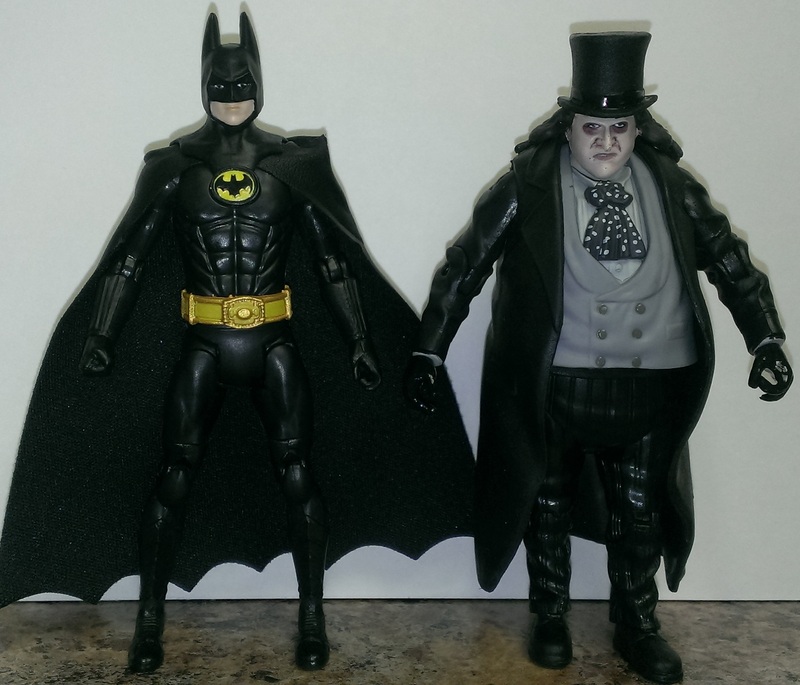 While Michael Keaton was no giant, the Penguin figure, with top hat, comes to the top of Keaton’s bat ears. The sculpting and likeness are terrific, but he seems to be caught between scales. 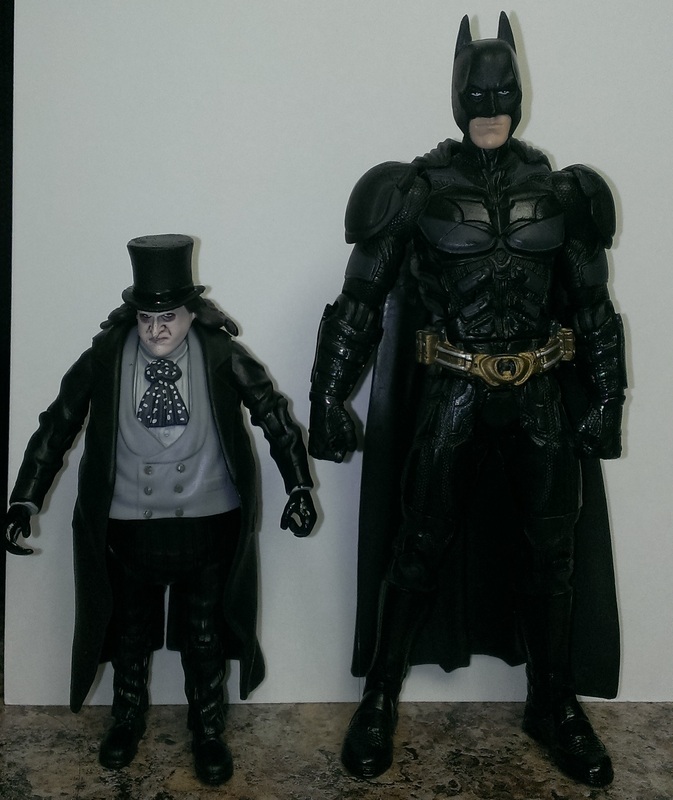 He’s too big for the 4-inch scale, but he’s too small for the Movie Masters “6-inch” scale (I put that in quotes because while both Movie Masters and DCUC are reported as 6-inch figures, the Movie Masters are markedly shorter ). Comes with properly scaled umbrella. Are these figures worth buying? Well, that all depends on where you’re shopping. Target currently sells them for $9.99, which is a fair price in this day and age. Toys ‘R’ Us, however, is selling them for $14.99 — with some selling them for as high as $17.99! So, don’t buy these are TRU, as they’re definitely not $18 toys.